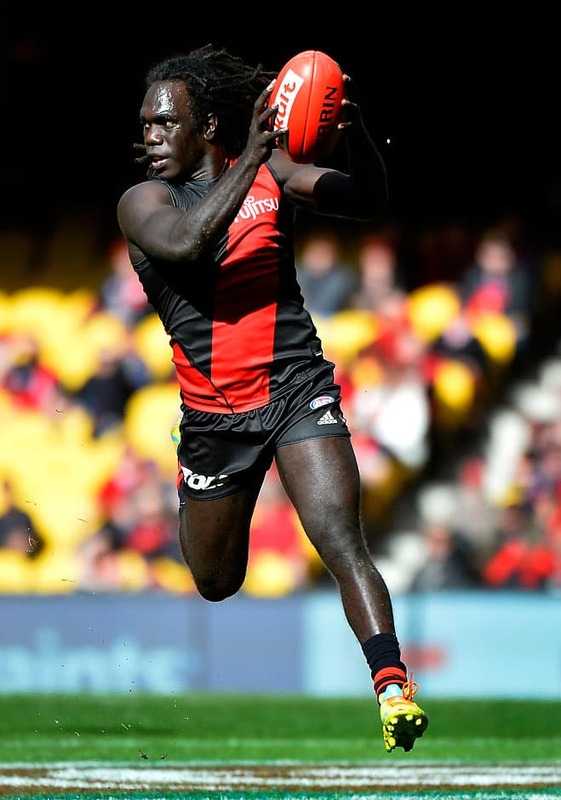 THERE has been plenty that has changed in Anthony McDonald-Tipungwuti's life since the start of this year, and plenty more that will change in the next few seasons as he aims to become a long-term player at Essendon. He has become used to being recognised by keen Bombers fans walking down the street, and he notices the cheers that grow from the crowd whenever he tucks the ball under his arm at half-back and bolts down the wing. He has also become familiar with seeing young Bombers wearing his No.43 jumper, and he has no plans to change his number next season, which will be his first of a three-year contract on Essendon's senior list. "I'm going to stick with No.43," he told AFL.com.au this week. "On my locker, Dean Rioli is the only player at Essendon to have reached 100 games in that number. There's only one name there and I want to be the second." McDonald-Tipungwuti will notch his 21st career game this weekend when the Bombers take on Carlton at the MCG in their season-closing encounter, and it is 21 more games than the 23-year-old expected when he joined Essendon. It is also a tally he doubts he could have managed had the Bombers not been hit by the season-long bans to 12 of their senior players in January. At that stage, McDonald-Tipungwuti was training as a forward. It is what he was drafted as last year as a rookie after three years with the club's VFL side, and where he felt most comfortable. But after the Court of Arbitration's decision to suspend the dozen Bombers for doping breaches, McDonald-Tipungwuti's role – and season – was turned on its head. "The circumstances changed and John [Worsfold] came back and said they'd play me at half-back and I said 'Oh OK, I'll do it'," he said. "I've used my speed and skills. I use what I have and work on things I need to work on, but speed was one I really had and had good skills and good kicking. Running was my biggest focus and I really improved that this year." He improved it so much that McDonald-Tipungwuti has quickly become one of Essendon's – and the competition's – biggest success stories of 2016. He ends the year in the Bombers' best team, with or without their returning players, and as the club's newest cult hero. His fierce attack on the ball, aggression towards the opposition, pace and foot skills have won many fans among the Essendon faithful. He regularly gets stopped walking down the street and has noticed the buzz in the crowd when he starts his dashing runs. At first, the attention felt strange to McDonald-Tipungwuti, who lived on Melville Island off the Northern Territory coast before moving to Victoria and pursuing his football. "I've got used to it and I treat it as my job now. I really enjoy meeting new people if they come up and say hello," he said. McDonald-Tipungwuti's previous job was at Essendon too, but in a different capacity. Last year he was working with the club's multicultural department, going out to schools and offering footy lessons. He approached Worsfold at the end of last year to discuss his hopes of getting onto the list when the new coach was into his first month at the club. He's glad he took the plunge and put his case forward. "It was during my lunch break and I thought I needed to go and talk to John and see what he said about me training with the boys. I ended up going in and was a bit nervous and went up to him and asked him if I could come up and train and have a go at AFL level," he said. "We had a chat from then and worked it out and I've really enjoyed playing under him. "I really enjoyed working [at the club] and learning different cultures, but AFL was my passion and I had to go for it." Having been around the club in a working capacity and as a member of Essendon's VFL side, regular Bombers players were already familiar with McDonald-Tipungwuti before he was rookie-listed. They were shocked by his body shape transformation in a short period of time, a fitness boost that allowed him to compete with them at pre-season training and build his endurance levels. He was overlooked at several drafts, and had begun to think an AFL career might have passed him by. Essendon has been a club that has produced strong indigenous voices over the past three decades, and McDonald-Tipungwuti is keen to use his building profile for good. "It's something I want to do, and encourage indigenous kids to achieve their goals, even if it's footy or just anything in life. I want to be that leader for everyone [so they know] they can achieve their goals if they put their mind to it," McDonald-Tipungwuti said. "It wasn't easy. It was pretty hard. But I had the support with my families and a few friends. I knew where I had to get and [it was the] AFL. I had to put my mind into it and I finally achieved it, and I've still got a few more years to come."